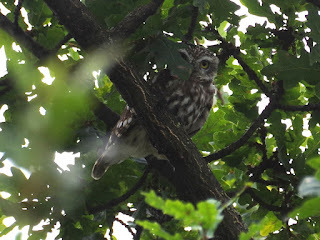 The male Little Owl in Hyde Park appeared in the oak tree near Bluebird Boats. 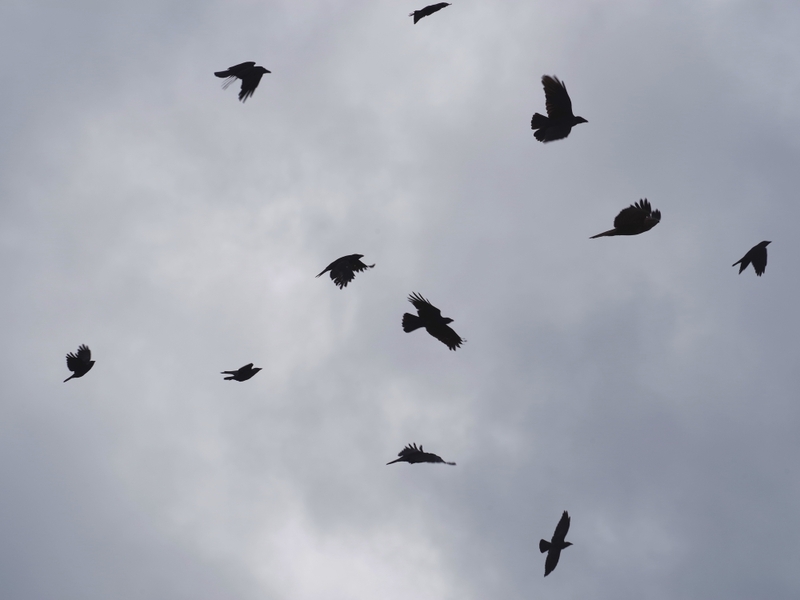 There was no sign of the Kestrel. When this noisy crowd flew over the Italian Garden I thought they might be mobbing her, but it was just a private dispute between Carrion Crows and Jackdaws. In the rowan trees on Buck Hill, a Mistle Thrush ate the ripe fruit. Under the tree, a Magpie and a Feral Pigeon fed on fallen fruit. A Dunnock found a larva in the bushes near the bridge. One of the young Grey Herons returned to the nest to preen. 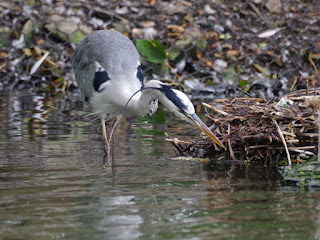 One of its parents was on the edge of the island poking at an abandoned Coot nest to find insects. 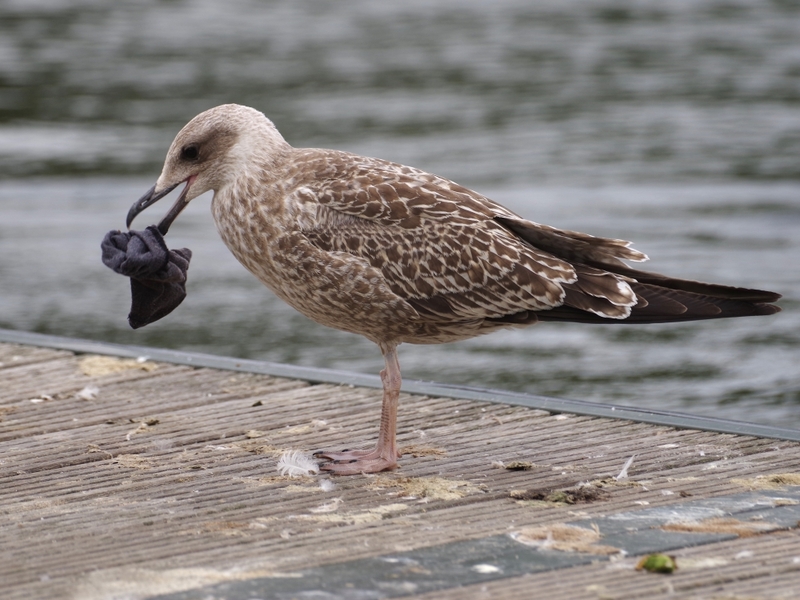 On the landing stage at the Diana fountain, a young Lesser Black-Backed Gull played with a child's sock. 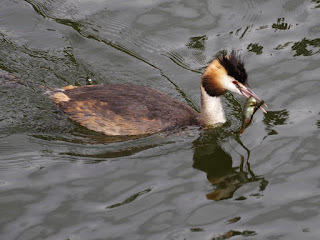 The number of Lesser Black-Backs in the park is increasing and many of them are young, which may be a sign that they have started breeding on local rooftops, just as the Herring Gulls did earlier. 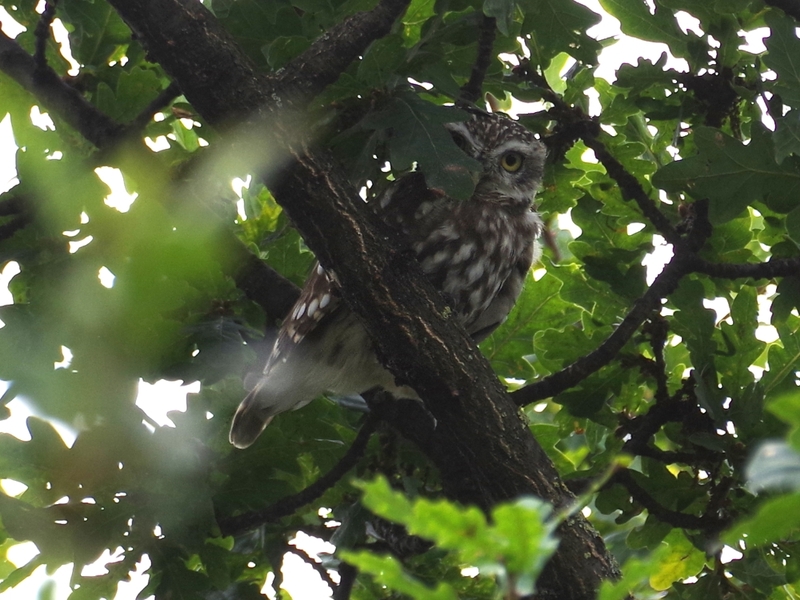 Here at the Round Pond there is a group of an adult, a second-summer bird beginning to get its dark grey back, and two speckled juveniles. One of the Great Crested Grebes at the bridge caught a fish and carried it to feed a chick on the other side. 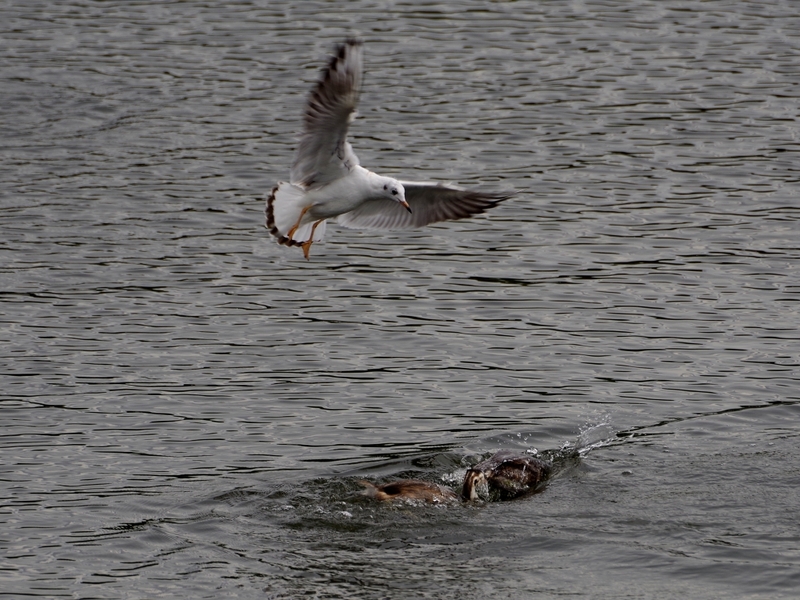 As the fish was being passed over, a Black-Headed Gull swooped down to grab it, and both parent and chick dived. The Moorhens in the Dell have bred successfully for several years in a row. 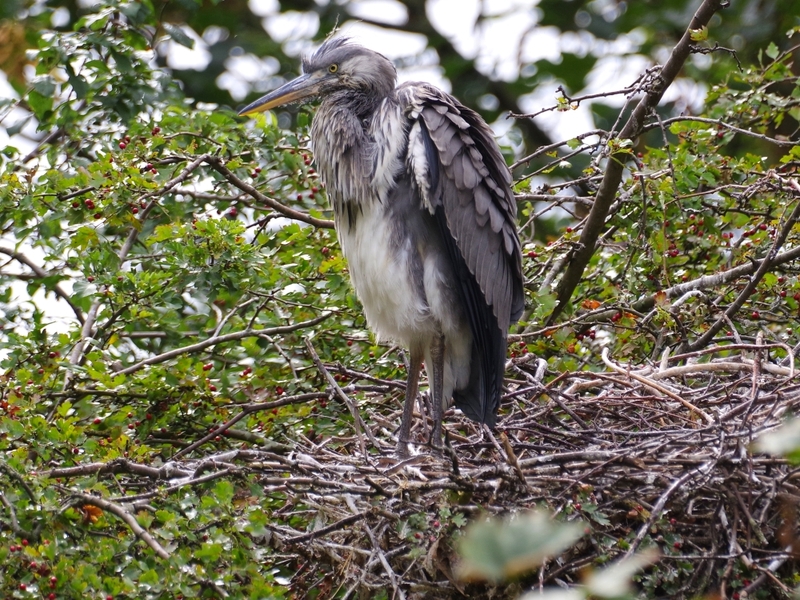 This year they have three chicks, now more than half grown. 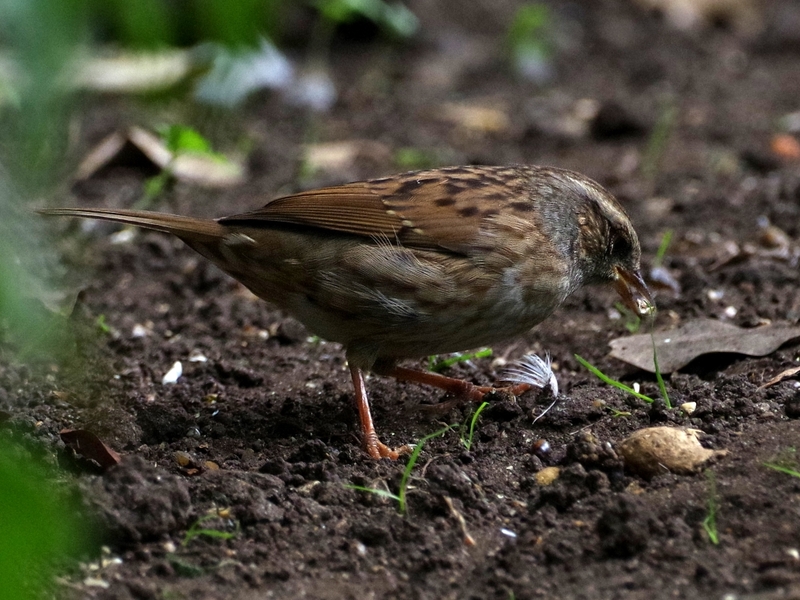 One of them foraged in the well maintained lawn, undamaged by the recent hot dry weather. At the Round Pond, the white and grey goose which we now know is a West of England Goose was grazing with a very dark Canada--Greylag hybrid. 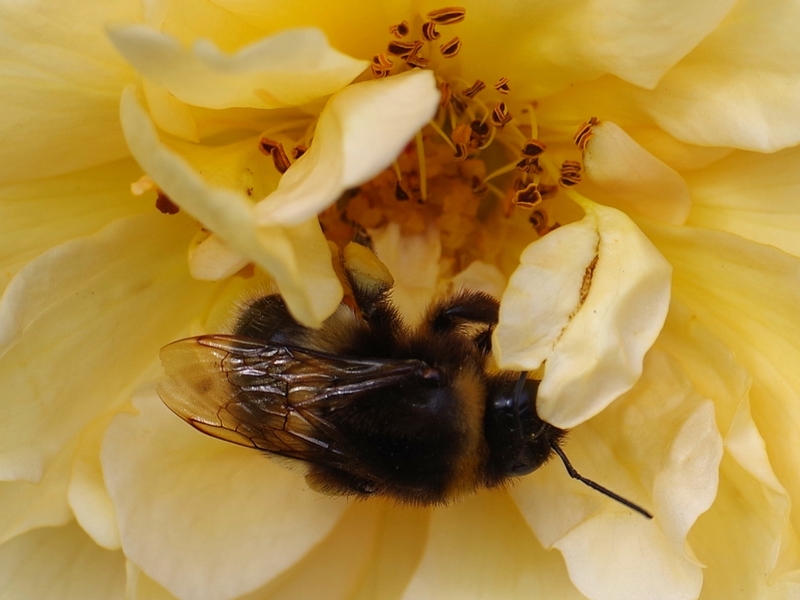 The roses in the Rose Garden generally don't attract bees, which prefer smaller and wilder flowers. But a White-Tailed Bumblebee was busy in a cream-coloured double rose. Very happy to see bumblebees again! I have missed them. I ought not to find Gulls' gait so funny, what with their being mean killing machines and all, but there really is something comical about the way they strut around. 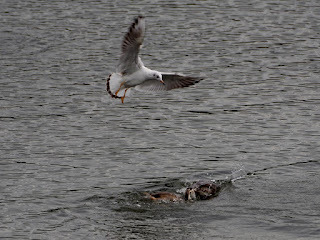 You have to admire gulls: intelligent and resourceful and no nastier than they need to be in order to survive.